Richard Parker, John Kenneth Galbraith: His life, his politics, his economics p. 532-3: "In virtually every respect, from Galbraith's point of view, Humphrey-Hawkins represented the worst of liberal remedies... (Leon Keyserling was among the bill's most vocal proponents, because, as Galbraith quipped, it was 'all Keyserling and no Keynes.')... To Galbraith, Humphrey-Hawkins was a mistake from the start, not only bad policy but bad politics." Jamie Galbraith, introducing Bruce Bartlett: "Bruce was a resolute supply-sider, having drafted the Kemp-Roth tax cuts. I was a resolute Keynesian, who had helped draft the Humphrey-Hawkins Full Employment Act. His specialty was taxation, mine was monetary policy. We were both twenty-nine years old." Casebeer: "In your view was [the Black thirty-hour bill] a misguided approach to recovery?" Keyserling: Yes, because I didn’t believe in sharing unemployment instead of creating jobs. The thirty-hour bill was an attempt to share unemployment by having a lot of people unemployed ten hours per week instead of a smaller number of people unemployed full time. My opposition to the shortened workweek has gone much further. When I was working closely with Walter Reuther many years later, when he was one of the main financial supporters of the Conference on Economic Progress, the labor movement started developing support for a shorter workweek, and Reuther asked me to help him oppose it. He said he just didn’t believe that the solution to the unemployment problem was shortening the workweek. He said we ought to have a shortening of the workweek only when we came to prefer more leisure rather than more work, and when we were productive enough to justify that, and our production needs were more fully met. But as an employment measure, he opposed it. Later, when we had so many recessions and so much unemployment, the labor pressure for a shorter workweek became so insistent even within the ClO, and later within the AFL-CIO, that Reuther stopped actively opposing it because it was futile, but he never actively supported it. "...the full employment policy by means of investment is only one particular application of an intellectual theorem. You can produce the result just as well by consuming more or working less. Personally I regard the investment policy as first aid. In U.S. it almost certainly will not do the trick. Less work is the ultimate solution (a 35 hour week in U.S. would do the trick now)." "As the third phase comes into sight... say 10-15years after the end of the war, when investment demand is so far saturated that it cannot be brought up to the indicated level of savings without embarking upon wasteful and unnecessary enterprises... It becomes necessary to encourage wise consumption and discourage saving, --and to absorb some part of the unwanted surplus by increasing leisure, more holidays (which are a wonderfully good way of getting rid of money) and shorter hours." UPDATE, January 16, 2011: reposted at Ecological Headstand. Ours is an age of interdependence. We all know this. We all know that no man and no nation can live alone. So it is that all the problems we face—economic or political, domestic or international are intimately related. Last night In Cincinnati, I spoke to a great audience on the issues of war and peace; and in the course of that speech, I spoke of the grave menace of inflation. Tonight, speaking to you mainly of inflation itself, I shall also be talking to you about war and peace. For, as you know, the inflation that afflicts our economy also affects the living standards and the political fate of nations all around the globe. What I mean when I talk to you about inflation tonight is simply this: The continuing shrinkage of the buying power of our dollar. The first fact about inflation is that it pervades every single aspect of our individual and national life. It aggravates the ceaseless struggle of the individual worker who feeds and clothes his family, no less than the global struggle to hold back the pressure of communism and the danger of war. Secondly: I am going to state how the present Administration has let this peril grow to its dread size today. Thirdly: I am going to state how the new Republican Administration will deal with the forces that are destroying the value of our dollar. To begin with, it is not easy for any one of us to realize how close to him this peril is. To the casual eye, our economy looks as healthy and serene—and rewarding—as a stretch of rich Ohio farmland. But the eye that looks sharp and deep will find in this agreeable prospect a concealed minefield. It is true that there is more money in existence, more being made today, than ever before in our history. But you know, just, as I know, that today's money simply doesn't go as far as the money we were paid in five years ago. Of course, everybody likes the comforting feeling of more money in his pocket, because it should mean that he is getting ahead. But today, we know that the comforting feeling is only an illusion. This illusion the Administration in Washington has systematically nourished and exploited for political gain for many years. The average American family had an income of $3550 in 1945. This average income had come up to $4800 by 1951. What did these higher earnings mean in the typical American home? Rising prices ate up nine tenths of the gain; rising taxes took the rest and a little more. The result: the family could actually buy less with its 1951 income than with its 1945 income. This is a measure of the achievement of an Administration which loudly claims: Millions will vote for us—because "they never had it so good." The peril, however, is not just of the present. Already it has begun to plunder our future. Individual plans for security in later years have shrivelled with the value of the money set aside. A $5000 policy written in 1945 has a purchasing power of only $3350 today. Pension plans have suffered the same fate, and so have savings accounts. If yours was an average family in 1945, you had savings of cash and securities of $430. Today that saying is worth only $300. The Administration has so mismanaged our economy that in order to lose $130 in five years, a man needed only to deposit $430 in a savings account—and leave it there to waste away. What a topsy-turvy triumph of an Administration whose press agents brag of its concern—of all things—for the American people's security. Now all this strikes me with particular force for a particular reason. I have spent a number of years in western Europe, as you know, trying to help our friends there set their houses in order and in strength. I have seen these war-shaken countries grapple with terrible problems of shortages and prices. And, along with many other Americans, I have warned: You must strengthen your currencies, beat back inflation, set your economic affairs straight—or you will lose the battle with communism without a gun being fired. How little we in our own United States have followed this sound course of action. Clemenceau once said that war is too serious a matter to be left to the generals. Today someone might well say inflation is too critical a matter to be left to the politicians of expediency. Now in what specific ways has the present Administration acted, or failed to act, so as to whittle away the purchasing power of the dollar? For here as in all great issues we face, the failures of the present Administration are the lessons of the next. The inflation we suffer is not an accident; it is a policy. It is not, as the Administration would have us believe some queer and deadly kind of economic bacteria breathed into the atmosphere by Soviet communism. This is the way a recent editorial in a great metropolitan newspaper put it: "Inflation is the calculated policy of the White House on the labor front, the fiscal front, the agricultural front." The point and purpose of this policy I have already indicated: to fool the people with a deceptive prosperity. The method is very simple: to give more people more money that is worth less. The resort to "cheap money," like the resort to cheap politics, is not new. It is one of the oldest, most standard devices of a regime dedicated to perpetuating itself in power. It is the mark of an Administration that cares more for the next election than for the next generation. Back through the centuries, to the days of the Romans and beyond, governments have cheated their people by this simple process. It used to be called "coin-clipping." When feudal lords and local officials in the Middle Ages tried to make fortunes at clipping coins, they often ended by getting the severest punishment an outraged people could give, cutting off their hands. We have a more humane and more effective remedy for today's coin-clipper—cutting them off from public office. Now the weakness of the Democratic Party for "cheap" or "soft" money is well known. For the last 20 years, it has practiced this policy faithfully. Of late, it has given it a new twist: it is now called "controlled inflation." But this name does not mean what it says. It really means inflation plus controls. The way this policy has worked out is easy to describe. With one hand the Administration has been turning up the water pressure at the hydrant, while with the other hand it has been trying to check the water's flow. The Administration's controls over prices are nothing but weak stop-gaps. The really effective controls — those over money and credit—were ignored by the Administration. Resort to those controls would have paralysed their scheme to use "cheap money" for their own ends. Now the Administration's liking for this idea of "useful inflation" confused even many of its own economists. A number of these men, angry or baffled—among them, Edwin Nourse and Marriner Eccles—resigned. Another result has been the spectacle of a struggle between the Federal Reserve Board and the Treasury Department over our country's credit and money policies. What would happen to an airplane in flight if the pilot and the copilot fought over the controls? With the end of Wor1d War II and the scarcity of goods for people to buy, the Nation faced the threat of rapidly rising prices. You did not have to be an economic expert to know that these prices would soar unless sound credit and money restraints were used. The Federal Reserve Board has power to impose such restraints. But under a Fair Deal Administration, the power of this independent agency was hamstrung. The Federal Reserve Board in the last seven years repeatedly wanted to tighten money control~—to strengthen money by credit restrictions. The Treasury until very recently, refused to go along. To restrict credit and raise interest rates, would have meant an increase in the interest paid on Government bonds. Otherwise Government bonds could not compete in the open market and their sale would fall off. Such an increase in interest rates might have cost the Treasury a maximum of two billion dollars annually in the post-war years. So—to save this two billion—the Treasury vetoed the controls, thereby promoting a postwar inflation that has raised the cost of our defense program by some 70 billion dollars. Public arguments about economics often leave many of us hopelessly confused. There is a great temptation to conclude that it is all too complex and that no one can do anything about it. But this is not the case. For the matter of the Administration's failure to fight inflation wisely is almost beyond partisan debate. A distinguished Democrat from the State of Illinois, Sen. Paul H. Douglas, described the Administration's policies in three words: "Lax, confused and imprudent." "The failure to take, restraining measures promptly and the actual supplying of more than a billion dollars of additional bank reserves . . . was, in my judgment, a gross blunder which far outweighed any offsetting gains to the American economic system." This is the record of how the Administration got us where we are. In the process, it has collected and spent in seven years more taxes than all 35 previous administrations put together through 156 years of national existence. That is quite a price to pay for the kind of economic leadership we have been getting! How, then, do we go about repairing this damaged and reclaiming our future? How do we get out of this mess? Here—as in foreign policy and most other areas—the blunders of the past are our soundest lessons for the future. First of all: We must erase the pernicious Administration maxim that says, "Inflation is the best policy." Here—as in every field of our Government—. It is not too late to go back to the simple truth that honesty is he best policy. It means an end to cheapening money. It means remembering an injunction of that forgotten man of the Democrat Party, Thomas Jefferson: "If we can prevent government from wasting the labors of the people under the pretense of taking care of them, they must become happy." The next step—after we have a sane and honest economic program again—will be to carry it out efficiently. We shall not allow our Government agencies to fight at the expense of the American people. We shall create an atmosphere in which the Federal Reserve Board, as an independent agency, and the Treasury Department act not as political enemies, but as economic allies in the war upon inflation. Next: The effective beginning of this war upon inflation must be an intelligent, planned attack on the spending program of our Federal Government. Let us stop for a moment and see just what this means. It means at the outset that businesslike methods must be applied to every program of the Federal Government to bring about efficiency and real savings. We must, of course, meet the carrying charges on the national debt, fulfill our responsibilities to our veterans. Some other inescapable charges against the Federal tax dollar include the costs of Social Security and farm price supports. These are planks of the floor under our national well-being and money must be spent to maintain them. The danger is that the dry rot of inflation will eat still deeper into its planks. These national programs urgently need the strength of a sound economy and a sound currency. But today most of our dollars—2 out of every 3 in fact— are spent not on these programs, but on defense. Herein the area of greatest cost to the American taxpayer—I know that savings can be made. This does not mean slowing the speed or cutting the size of the rearmament program we need. No responsible citizen could foster such folly in today's world. it means subjecting all the Pentagon's costly operations to the scrutiny of business and professional examiners who can speak for the executive with expert knowledge. I tell you this from my own experience: Informed, intelligent scrutiny of military spending can effect substantial savings in our huge defense program. We must save those other sums, taken out of American pockets and bank accounts, that have for years bought nothing but governmental waste and corruption. How much this amounts to, we cannot know. We cannot expect the Administration to be eager to tell us. But we can and will find ourselves, starting next January. Knocking down the Administration idol of cheap money, getting unified action from our economic agencies. And slicing the fat out of the Federal budget—these are serious, important beginnings in toughening our economy. It is clear that the major attack we make has to be on a front wider than just money and credit policies. As I said at the outset: all our problems today are tied to one another, and none can be solved by itself. With tens of billions spent on armaments, another six to seven billion yearly on foreign aid, we see again that the soundness of our financial health at home depends on the soundness of our foreign policy. The blunt truth is this: we cannot bear this huge burden indefinitely. We cannot—year after year, decade after decade— both maintain our standard of living, finance huge armaments, and help to rebuild economies of nations all around the globe. We cannot, in short, win the peace with foreign policy of drift, makeshift, and make-believe. We must 'honestly face the fact that such a policy not only fails to secure the peace: it also places the hopes of the free world in jeopardy by the strain it puts on our economy., and by the confusion it creates in other lands. There is in certain quarters the view that national prosperity depends on the production of armaments and that any reduction in arms output might biring on another recession. Does this mean, then that the continued failure of our foreign policy is the only way to pay for the failure of our fiscal policy? According to this way of thinking, the success of our foreign policy would mean a depression. THERE is, of course, one answer to such an argument that the Administration on its record cannot give. That is a soundly conceived program of tax reduction, Such an approach would seek to fill the economic gap left when rearmament can be reduced. Tax reduction is a way to boost consumer buying power and to let the people spend their own money instead of the Government spending it for them. ft is a way to breathe new life into industries throttled by Federal sales or excise taxes. It Is a. way to open new opportunities to the genius of American businessmen and the skill of American labor. Here, too, is the way to give State and local governments—in need of help for long-delayed school projects and highway programs — a fairer share of the tax dollar. Such an approach—tax reduction is an essential part of our program to achieve prosperity without war. To this theme I shall return more fully at a later time In this campaign. I have confidence in the good sense and skill of leaders of American business and labor. Because of this confidence I cannot share in any forecast of economic doom. But my concern for America’s future is tOo keen for me to leave unchallenged those who boast our prosperity is sound and deeply rooted. Much as we wish that it were, there stirs in Americans today a haunting sense of insecurity. Prosperity—like peace—is not just a skirmish, but a continuing campaign to be vigilantly waged. Prosperity—like peace—cannot be won by policies that never rise above the level of playing by ear or of seeking votes. Prosperity—like peace—cannot be won by a Government divided against Itself. I remain hopeful of our future. The party, too long In I power—worn and weary in office—threatens Americans with bogeys from the past. They offer to us Americans only one choice: the choice between today and yesterday. But that is not the choice we have. The true choice is between an uneasy today and a confident tomorrow that can be abundant and secure. [?] Americans will make that choice. Primitive Communism Or Anarchism In Tanzania? There are things I envy about the Hadza -- mostly, how free they appear to be. Free from possessions. Free of most social duties. Free from religious strictures. Free from family responsibilities. Free from schedules, jobs, bosses, bills, taxes, laws, and money. Free from worry. Free to burp and fart without apology, to grab food and smoke and run shirtless through the thorns. Have I Been Wrong About Iran And Nukes? I have long argued going back to the old Maxspeak that US attitudes towards the Iranian nuclear program were hysterical, given the fatwa against nuclear weapons by its Supreme Leader, Ayatollah Khamenei. That they did not have a nuclear weapons program was long supported by the highly respected director of the IAEA, Mohammed ElBaradei. Now, his last act before stepping aside on Dec. 1 has been to censure Iran for secrecy in its program and pulling back from the agreement with the US I praised quite recently, with Russia, China, and India joining in on the censure. Have I been wrong all along on this? Maybe, but maybe not. Juan Cole at http://www.juancole.com argues that Iran is still not actively pursuing nuclear weapons, but that there is a power struggle going on within it, with Khamenei on one side and the more militant Revolutionary Guard on the other, with the latter winning. He says they want the "Japan option," a "rapid breakout capability," but not actual weapons, and they are defeating Khamenei on this. It is their rise that explains the pullback of Iran from the agreement with Obama, which was negotiated by a personal representative of Khamenei, who has now been repudiated. None of this is good news, but it is also not the end of the world exactly either. I have completed the last part of my lecture and have edited it. I still hope to incorporate data on the defunding of higher education. Encomium To The Bielefeld And Ancona Schools: A Way Forward In Macroeconomics? Mark Thoma has linked to a post by Rajiv Sethi on the significance of nonlinear macrodynamic models derived from that of Richard Goodwin in 1951. I see this tradition linking with that from Minsky in two current schools of macroeconomic thought that I see as offering a wise way forward, the Bielefeld School and the related Ancona School. The former stresses "Keynes-Metzler-Goodwin" dynamics in such books as _Foundations for a Disequilibrium Theory of the Business Cycle: Qualitative Analysis and Quantitative Assessment_, 2005, Cambridge University Press, by Carl Chiarella, Peter Flaschel, and Reiner Franke, in the Foreword to which I coined the moniker "Bielefeld School," labeling it a species of Post Keynesianism, although some of them do not like that because of a perceived anti-math bias among some Post Keynesians. The "Ancona School" (a term I believe that I am neologizing here now) is exemplified by the recent book by Domenico Delli Gatti, Edoardo Gaffeo, Mauro Gallegati, Gianfranco Giulioni, and Antonio Palestrini, _Emergent Macroeconomics: An Agent-Based Approach to Business Fluctuations_, 2008, Springer. While the former school is somewhat more aggegated-oriented and the latter is more "bottom-up" agent-based oriented, they link through the University of Urbino where chaotician Laura Gardini, a sometime coauthor of Delli Gatti and Gallegati, has held conferences where they have interacted with Carl Chiarella, who has become involved with agent-based modeling of financial and economic markets. Both schools emphasize modeling nonlinear interactions between financial and real output markets. The Bielefeld School is somewhat older, with most of its members being based elsewhere, but with much of the work in terms of numerous books and papers being done while those people have visited Bielefeld, where Peter Flaschel has been permanently based. Chiarella's main base is the University of Technology-Sydney while Franke is at the University of Bremen. Some others who have coauthored with this group include Willi Semmler who is halftime at Bielefeld and the New School (where mentor Duncan Foley is located), Toichiro Asada of Chuo University in Japan, Peter Skott of the University of Massachusetts-Amherst (who provides a link to more conventional Post Keynesians such as Phil Arestis), and Rajiv Sethi himself, who was a grad student at Bielefeld for two years and has coauthored with Franke, among some others. The key figure in the Ancona School is Mauro Gallegati, with all the authors of the above-mentioned book being his former grad students (I think) except for longtime coauthor Delli Gatti who is at Milan with Pasinetti, with both of them having worked with Minsky shortly before his death. Gallegati co-founded with Alan Kirman the Workshop on Economic Heterogeneous Interacting Agents (WEHIA, also known as ESHIA), which now has its own journal, the Journal of Economic Interaction and Coordination. Besides his c0-founding role, Gallegati's home base in Ancona deserves the moniker for this school as the conferences of WEHIA for the first several of its years of existence took place there at the Universita di Politecnica de Marche (sp? ), where Gallegati is based. He and Kirman and some others edited volumes of proceedings from those conferences, most of them published by Springer. Again, while these two schools have some differences in their approaches, I see them as closely related in methodology and general views, and some combination of the two looks to me to provide as good a view of what is going on now as we have, as well as a promising way forward in terms of research and understanding. A perennial puzzle for advocates of work time reduction is the angry rejoinder that one is promoting a "panacea". The knee-jerk indictment flies off the pigeonhole shelf so fast and furious one has to duck to avoid being clobbered by ricocheting chunks of boilerplate. Elinor Ostrom et al. offer an explanation. "In the governance of human-environment interactions, a panacea refers to recommendations that a single governance-system blueprint (e.g., government ownership, privatization, community property) should be applied to all environmental problems...."
Advocates of panaceas make two false assumptions: (i) all problems, whether they are different challenges within a single resource system or across a diverse set of resources, are similar enough to be represented by a small class of formal models; and (ii) the set of preferences, the possible roles of information, and individual perceptions and reactions are assumed to be the same as those in developed Western market economies. "As proponents of collaborative approaches to resource management," Conley and Moote were, "unnerved by the ways in which these processes have been portrayed as a cure-all." Now, who is most likely to portray collaborative approaches as a cure-all? The culprits are those who insist the loudest that the only solution is privatization... government regulation... or government ownership or spending. Look again at those two false assumptions of the panacea peddlers: small class of formal models; preferences and reactions typified by market economy. The clue here is that the purveyors of the most stereotyped blueprint solutions have adopted the cry of "panacea!" as their first defence against any threatening non-orthodoxy. The model for that behavior is that of the flatulent school-boy who preemptively demands "who farted?!" as a strategy for asserting his innocence by alleging someone else's guilt. The corresponding conclusion can only be "he who smelled it, dealt it." "....The interviewee asserted that doctors have provided professional assistance to patients, including those provided them with all the necessary drugs, which, however, did not lead to recovery. "It's an infection, which, when it enters the body can not handle: three days and people die," - she said. According to doctors, among the dead - three young people aged 26-27 years, one 11-year-old child and 40-year-old man. The employee also said the city polyclinic UNIAN that the most likely cause of death is some unknown virus. She noticed that, as a rule, for the entire period of the season increased risk of influenza in the region died of 1-2 persons. "Nobody knows anything" - she described the situation with the patients. She also expressed the view that the virus has an effect similar to AIDS, which weakens the immune system. "Something is killing immunity", - said the doctor.The employee called the local hospital and the inadequate diagnosis of the causes of deaths - "poslegrippovye complications", stressing that they may occur after a person was sick for some time. "Influenza can give a complication in the kidney, for example, but it later - after the disease" - she said...."
A new strain of H1N1 influenza virus (swine flu) began in March this year. “Localized outbreaks of influenza-like illness (ILI) were detected in three areas initially in Mexico and soon after in the United States. Following the discovery of the new strain in the United States, its presence was quickly confirmed in multiple nations across several continents.” In April 1,600 suspected cases were reported. By the 10th November more than a million people in Ukraine had become infected. The pandemic appears to have quickly spread to other parts of Europe. See map. The mortality and morbidity statistics for this flu pandemic in the Ukraine appear to be significantly understated. Despite a very dramatic rise in the incidence of the disease, the death stats present a picture of a remarkably low and stable death rate. Further, mortality stats for this swine flu epidemic are notably lower in the Ukraine than they are in the US. Why? The Ukraine health facilities are very poor in comparison. The H1NI virus is reported to be at a tipping point for lethality. Minor changes, such as a single change in one gene segment, can have major effects . There's been no media coverage on this pandemic at all in the Australian media as far as I am aware. So you are bascally implying that this is evidence that H1N1 and it's eight genomes has mutated into a more severe form. Increased virulence / lethality can involve one change on one gene segment. H1N1 is at a tipping point, and minor changes can have major effects. Jonathan Gruber is a health economist from MIT -- an expert, no doubt. David Leonhardt quotes his favorable comment on the Senate health care bill: "I can’t think of a thing to try that they didn’t try." I was going to post something about Obama’s apparent decision to endorse a “compromise” semi-surge in Afghanistan, but then it occurred to me that there is nothing new to talk about; it is the same old, same old. He is continuing his own pattern of leading-by-following, and in this he is representative of the global center-left, which has been slowly putting itself to sleep since the 1980s. This is worth a few words, perhaps. In a sense, it all goes back to the return of the hard right as a potent political force in the 1980s. This was more pronounced in the English-speaking world than elsewhere, but a parallel pattern can be seen in societies that had stronger social-democratic traditions. For various reasons, the leading parties—the Democrats in the US, Labor in England, the Social Democrats in Germany, the Socialists in France, the party-of-the-month in Italy (currently the Democrats)—came to redefine themselves as the non-right. Vote for us, they said, and prevent the right from undoing our former hard-won victories. In part, this transformation reflected a misreading of the new political climate. The problem was defined as “appealing to the voters” and assembling a governing majority, but this was the symptom, not the cause. As a mass of polling data largely confirms, there has been no seismic shift in public opinion; this is not why the roll-back right has gained the initiative. In a capitalist society, where prosperity depends on business investment and politicking itself is a capital-intensive enterprise, governing majorities are always assembled from the top. First there must be a sufficiently large segment of business and financial interests willing to mobilize behind a political project, and then this project must be sold to the electorate. The rise of the right is based in large part on the coalescing of such a mosaic of elites behind their program. Sometimes they win and sometimes they lose in their pursuit of an electoral majority, but they are always a force, and each win further institutionalizes their objectives. The core problem of the center-left is that they do not have a base in the business/financial upper tier, except as a brake on the ambitions of the right. In other words, they do not have a program that can attract the support of enough of these interests, which they can then take to the voters. But without a program they become progressively less effective as political mobilizers, and they achieve little to nothing in their terms in office. In Europe the crisis of the center-left has reached its Wiley Coyote moment. In most of these countries the political system is organized to permit a number of minority parties, and voters who still believe that parties should have programs have abandoned the center-left dinosaurs for these alternatives. In no country, however, is there any prospect that one of the newcomers, or even a coalition of them, will succeed in governing. The triumph of the right, in the context of one of capitalism’s worst traumas, is mainly a matter of filling a vacuum. In the US the Democrats stumble on as the party of the non-neocons. The Bush legacy elected Obama, just as Clinton survived thanks to the willingness of Newt Gingrich to periodically scare the bejesus out of everyone with a modicum of reality contact. But there has been and is no program. Obama’s “program” in health care is to get a bill passed, whatever its content. His “program” on climate change is to get a bill passed, eventually, of some sort. His “program” on finance is to prevent a collapse and hope that the system will reform itself. His “program” on Afghanistan is to identify the minimum number of additional troops that will protect Democrats from the accusation that they are soft and unpatriotic. In short, he is likely to further hollow out the Democratic Party as a political enterprise and leave little legacy of social progress. The only reason the Democrats will not implode as their European counterparts have is that our system effectively excludes minority parties, and the Republicans are scarier than ever. We need a dramatically different direction in politics. By now most have heard about the hacking of emails at the East Anglia Climate Research Unit, with revelations of questionable conduct by Michael Mann, Phil Jones, and others, including apparent efforts to cover up embarrassing facts and manipulate refereeing processes at journals. There have been piles of posts all over, and many people spouting off about this, with global warming skeptics pronouncing this to be the definitive proof that they are right (or at least not as unprofessional as some of those arguing for anthropogenic global warming). I note the response of those at the CRU. I also note that they should indeed be embarrassed at some of which has been uncovered. It is indeed unfortunate that the scientific discussion has degenerated into such a slime pit of personalistic attacks and exaggerations. The skeptics are on the attack now, but the other crowd has attacked as well, and much of this is truly internecine. Thus, two of the major contenders and players in the emails are Michael Mann and Patrick Michaels. They were both in the same department at the University of Virginia for some time and were both there when the great controversy over the "hockey stick" erupted (neither are there now). This was a diagram first cooked up by Mann that showed rapid recent warming compared to earlier periods, which received lots of publicity, including in one IPCC report. It turned out the original study was flawed in terms of both data and statistical methodology. Some of the more pathetic floundering in the emails surrounds this. However, it must be noted that more recent data and better statistical methodology has largely confirmed the hockey stick result. We have been in a period of amazingly exceptionally rapid warming recently. I will also note that this hack job may well be revenge for an attack from the other side on Michaels that was overdone. This was triggered by a Paul Krugman column on May 27, 2006, in which he attacked Michaels for testimony he gave a Senate committee about other testimony by James Hanson. While I agreed that Michaels could be criticized for some of what he said (just as I think Mann and crew can be criticized for some of what they have said), I thought at the time and said so in various places that the attack on him was overdone. One can read Brad DeLong's account of Krugman's argument, Michaels' own defense of himself, and Hansen's take on it. This stuff has been going on for some time. The school invited me to give the annual lecture on December 8. I'm trying to copyedit The Invisible Handcuffs, finish two articles before a December 1 deadline, and grade papers before school starts next week. My idea is to show how ideas evolve with my books, paralleled with both the course of the economy and the course of higher education, particularly in California. I don't have much data on education yet. I have roughed out the first draft of the talk, which I'm sure will have a lot of problems. If anyone has any these suggestions for improvement, I would be more than grateful. I will leave it to Dean Baker and Paul Krugman, who get paid to do this, to tear into the errors and absurdities of this latest bit of agitprop from the New York Times on the phantom menace of fiscal deficits. What I would like to raise is the issue of institutional responsibility. You would think that the Times might have learned from its earlier foray into phantom WMD’s that playing the lead public role in a campaign of deception can have devastating consequences, particularly if the end product is a policy that implodes on its own mythology. This is what happened in Iraq: blatant falsehoods published as fact in the news outlet that feeds stories to the rest of the media (now that they have downsized their own news-gathering forces) came back to haunt them when, instead of WMD’s, soldiers were met with IED’s. Let’s hope this campaign to reproduce 1937 is the inspiration of a rump group in the financial elite with little influence on actual policy. If deficit-cutting becomes the new imperative in Washington, however, and the economy duly melts, we will have to suffer through more public contrition on the part of the Times’ editorial brass. Jamie Galbraith rallies the faithful: "Sorry to be defeatist - it’s the way I feel. Prove me wrong." Seventy-six years ago a Senator from Alabama — yes, Jamie, Alabama — proposed a solution to an earlier unemployment crisis. And you know what? The Senate approved it 53-30. But the Big Boys objected and we got the NRA instead. "It will be remembered," wrote brain truster Rexford Tugwell, "that one of the reasons why NRA was sponsored by Roosevelt, and why the act was passed in the special session of spring, was the threat of a thirty-hour law being pushed by Senator Hugo Black." Tugwell was wrong. It has not been remembered. It is forgotten that Roosevelt only acted in the face of a more radical mobilization. The problem with the solutions you propose, Jamie, is that they are the kind of moderate, respectable responses that might be forthcoming from an Obama administration if (and only if) there was momentum building for a more radical response to the jobs crisis. There is a 240-year arc to this crisis, a 60-year arc and a 30-year arc. The 240-year arc is "capitalism". The 60-year arc is "the cold war" and the 30-year arc is "neo-liberalism". Until enough people understand how those three arcs relate to each other, there’s not going to be any resolution of this crisis. Moving beyond the neo-liberalism of the last 30 years cannot mean restoring some solution from a more distant past. What is most frightening about the present crisis is that its resolution has the potential for a previously inconceivable degree of emancipation. It is precisely the THREAT of freedom that is evoking such great resistance. "Civilization has to defend itself against the specter of a world which could be free. If society cannot use its growing productivity for reducing repression (because such usage would upset the hierarchy of the status quo), productivity must be turned against the individuals; it becomes itself an instrument of universal control." In June this year an Australian by the name of Paul Gilding made an interesting statement about the cause of the global financial crisis. Gilding gives public talks around the world highlighting the alarming issue of global climate change. In his talk he said that in July 2008 the world entered ‘the crash’ that resulted from a planetary economic and environmental system pushed to its limits. ‘Distributed impacts’, an interesting concept for economics. We could imagine that the global economy collapsed last year because of a giant financial ponzi scheme reaching its logical conclusion. However, the existence of diverse (and much more widespread) currents of collapse in the environment and society could explain why this apparently mindless financial engineering game existed in the first instance. Regulation of the global financial system won’t cut the cake. There needs to be a move away from streamlined thought produced by the machinery of propaganda. Can we no longer differentiate between the world that made us and the world we made? If we could, would we see that corporations are more often not the creators of wealth - their efficiency often merely lies in how quickly they can usurp natural and human capital. Militarism and empire strategies make the concept of ‘comparative advantage’ in trade null and void. ‘Freedom’ is not the right to impose our will on our environment in violation of natural laws. ‘My country’ is the world. ‘The crisis’ is not a deficiency of demand but one of supply. The earth does not belong to man – man belongs to the earth. Richard J Barnet & Ronald E Muller. ‘Global Reach – The Power of the Multinational Corporations’. Touchstone publishers. 1974. Page 190. C Wright Mills, ‘The Power Elite’ Oxford University Press. 1956. Page 165. Theresa Brennan ‘Globalisation and its Terrors’ Routledge 2003. His only idea that could put the brake on growth would be cutting working hours. Here he takes the economist’s famous “lump of labour” fallacy – the idea that there is only a fixed amount of work to do that has to be shared round – and suggests it should be a goal of policy. Yet in anything other than a perfect utopia, the idea that there is no more work that needs doing is ludicrous. Indeed, the idea that "there is no more work to be done" would be ludicrous. But that's not the same idea as the idea that we need to make up wasteful things to do just to keep people in jobs. Said Galbraith: "Mr. Keyserling has been reading my books and watching my actions for the last 10 years and finding evidence of wickedness which even I would not have thought possible. Feeling as he does, he was certainly right to alert the public." John Kenneth Galbraith, national chairman of the Americans for Democratic Action, took formal notice yesterday of charges that he has long been engaged in a devious campaign to defeat President Johnnson. The accusations were leveled Tuesday by fellow economist Leon H. Keyserling in a protest against ADA's weekend endorsement of Sen. Eugene J. McCarthy for President. California Collapsing: What Would Reagan Do? When he was in office, Ronald Reagan looked bad. Now, by today's standards, he looks like a progressive. Reagan, Ronald. 1973. "On Spending and the Nature of Government." National Review (7 December). "When I took office in 1967, we discovered that the promise of "no tax increases" could not be carried out. California was virtually insolvent, the precious administration having changed that state's system of budgetary bookkeeping in a way that allowed the spending of 15 months' revenue in twelve months' time, thus avoiding a major tax increase in election year 1966. The state government was spending $1 million a day more than it was collecting." "California, unlike the Federal Government, cannot print more money or pile up deficits. The governor is required to submit a balanced budget, and if any additional taxes are needed to balance revenues with spending, the constitution requires the governor to propose higher taxes." "So our first major lesson in government was painful: for the taxpayers and for us. We had to increase taxes by some $800 million to balance the unbalanced budget we inherited." 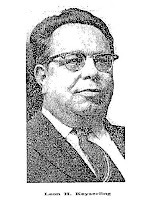 Clyde E. Dankert was a "widely respected" labor economist who in 1965 edited an Industrial Relations Research Association volume on Hours of Work. His textbook, Contemporary Unionism in the United States, was published in 1948 by Prentice-Hall. I have read some bizarre attempts to explain the inexplicable "lump of labor fallacy" but this one is delirious. In it, Dankert claims that those who believe a given reduction in the hours of work will result in a permanent reduction in unemployment subscribe to the lump of labor fallacy. What do you call it when an argument doesn't even have enough solid straw in it to qualify as a straw man? I’m working on a project that involves, among other things, looking at taxes on financial transactions, and I’ve thought myself into an idea that I’d like to float to our skeptical readership. The short version: Tobin taxes, Keynes taxes, and other financial transaction taxes have been sold on the grounds they would reduce price volatility. There is some controversy about this, and the case is not at all clear. I think, however, that increasing transaction costs could have the effect of reducing the complexity of trading strategies, and that might be a very positive thing. The original proponent of a transaction tax was Keynes, who wanted to apply it to the stock market. He thought that it would have the effect of penalizing speculative strategies with high turnover, while rewarding buy-to-hold strategies. His views on financial markets as casinos are well known, and the tax proposal fits like a glove. Tobin, writing after the collapse of Bretton Woods and its fixed exchange rates, zeroed in on foreign exchange transactions. He worried about excess volatility in currency markets and applied Keynes’ logic to that sphere. The argument about “real” versus “speculative” motives for transactions is plausible but much too simple. In particular, it makes assumptions about hedging strategies that are unfounded. The simplest version of such a strategy is that you take a position in the forex markets that is the reverse of the one you take in your real (goods and services) transactions. This means that you would double the volume of real trade to get the real-plus-hedged component of forex transactions, and as we know the latter is a vast multiple of the former. But hedges can be quite a bit more complicated. One can try to hedge a variety of risk factors, not only exchange rates but also interest rates, commodity prices, etc., and these risks may interact in nonobvious ways. Moreover, one can shade or fine-tune a hedge, or generate a package of hedges that have properties that a simple reverse-position transaction cannot emulate. Without knowing the deep microstructure of these markets, it is impossible to know a priori how much of the transaction volume is risk averting (hedging) rather than risk-seeking (speculation). Empirically, there have been studies that claim that transaction costs (which a transaction tax would augment) have been positively associated with volatility in foreign exchange markets. These, to my knowledge, have not been refuted. As I see it, the intellectual and political winds have therefore shifted on transaction taxes. Keynes and Tobin wanted a tax big enough to change behavior, because they thought markets needed to be checked. Contemporary proposals, which are gaining momentum, have much lower tax rates precisely to avoid altering the behavior of market players. We are now hearing about a tax of a basis point or less on the value of transactions, not enough to change the way markets work, positively or negatively. But I think the fixation on the terms of contracts (short term vs long) misses the point. A transaction tax penalizes a trading strategy according to the volume of transactions it entails. Consider again the hedge. A reverse position is the simplest hedge, and it consists of just one transaction. Granted, it may be too simple to meet the needs of sophisticated players, but this is not an argument for unlimited complexity. Complexity renders market positions opaque and creates potential for systemic faults that are invisible even to the well-trained eye. Note that transaction costs fall as one moves from simple/actual transactions (like spots and outright forwards) to more complex ones (derivatives). Apparently such costs were not sufficient to prevent the emergence of fantastically complex strategies that entailed taking conditional positions in a plethora of markets simultaneously—a complexification that culminated in collapse. The conclusion appears to be that these costs need to be raised. In other words, it is not the term of the trade that should attract a tax, but the sheer number of such trades to support a single position-taking. I have argued previously that there was a dialectical relationship between the complexity of trading strategies and the extent of leverage. More leverage justified putting resources into increasingly complex strategies that offered minuscule margins. The perception that such mini-margins could be attained as a sure thing (all risk offloaded) justified leveraging that would otherwise have been viewed as outré. Hence there may well be a case for a large enough transaction tax to alter behavior, but with a different purpose. The issue is not how much volatility it discourages, but how much complexity and inducement to excess leverage..
How Digital "Piracy" Creates Value. Dealbook. 2009. "EBay Settles Suit Over Skype Sale." New York Times (6 November). "Skype brought in $185 million for eBay in the last quarter and was the fastest-growing part of its business." Stone, Brad. 2009. "Founders Win a Piece of Skype From eBay." New York Times (6 November): p. B 3. "eBay has formally settled the litigation around its sale of the Skype online calling service. The founders of Skype, Niklas Zennstrom and Janus Friis, will drop their lawsuits against the company and a consortium of buyers whose bid to purchase 65 percent of Skype was announced last month, according to an announcement released by eBay before the opening of the stock markets on Friday. As part of the complex agreement, the founders will own a 14 percent stake in the new Skype and receive two seats on the board." "The founders will also transfer the disputed intellectual property owned by their company Joltid, which was at the heart of the legal battle, over to Skype." Joe Nocera, Joe. 2009. "The Cloud Hanging Over Skype." New York Times (5 September): p. B 1. "In 2005, when eBay bought Skype from its founders, Janus Friis and Niklas Zennstrom, it paid $3.1 billion. But the company had performed so poorly that by the fall of 2007, eBay had been forced to take a $1.1 billion write-down." "Not long after Mr. Friis and Mr. Zennstrom left the company, they became embroiled in a dispute with eBay that has turned into a very nasty lawsuit. It turns out that in selling Skype to eBay, Mr. Friis and Mr. Zennstrom retained control of a key part of the Skype technology, which they licensed to eBay. Although the details are under seal in a London court, the Skype founders' essential complaint is that eBay tampered with their software, and in doing so, violated the terms of the licensing agreement. They were demanding that Skype be forced to stop using the technology, which, for all intents and purposes, would mean shutting down Skype itself. The case is set for trial in 2010." "In a court hearing in London last June, eBay's lawyer told the court that if Mr. Friis and Mr. Zennstrom won the case, the result would be "devastating"." "Skype was not Mr. Friis's and Mr. Zennstrom's first company. No, that was the infamous Kazaa, a peer-to-peer company that the two men founded in 1999, not long after Napster showed the world exactly how easy it was to steal copyrighted music using peer-to-peer computing. By 2001, the recording industry, having routed Napster, turned its sights on Kazaa." " In 2003, when they started Skype, that same technology that had powered Kazaa became an important part of the Skype code; it was the means by which computer users connected to each other and created a larger network. (VoIP -- voice over Internet protocol -- was the means by which they spoke to each other online.) But Skype never owned the technology; JoltID did. Why eBay was willing to go along with such an arrangement when it bought Skype two years later will forever be a puzzle. But so long as the two men remained part of the eBay "family," it didn't matter much. Any changes to the peer-to-peer code were ones they approved"." "When the deal went sour, however, and the founders left eBay, that all changed. And when eBay continued to tinker with the code -- something eBay contends it has a right to do under the license -- they entered into negotiations that went nowhere. Finally, by March of 2009, the two sides had sued each other." Conflict of Interest? Economists? Impossible. The controversy over medical researchers taking money from drug companies continues. Universities are being called out for their failure to disclose to public agencies the other, private grants researchers are pulling in. The article discusses the competition between research shops for the star grant recipients, but discreetly fails to point out that the universities themselves get a cut of the proceeds, so that the conflict of interest is theirs too. I’ve mentioned this in the past and will repeat now: there is no corresponding policy, not even rules to be broken, in economics. Public funders and some foundations require an acknowledgment in the published research they support, but this is about “thank you”, not probity. Any disclosure of other, privately-interested funding sources by economists is strictly voluntary, and in practice seldom occurs. Trade researchers can be funded by foreign governments or business associations, health researchers by tobacco companies, law and economics researchers by trade associations facing tort claims, agricultural researchers by agribusiness, and on and on. Turn on the recording function of your iPhone as you saunter the halls in Atlanta in January, and you will pick up lots of tidbits about economists proudly on the take. Where should we begin to reform this profession? Would an AEA resolution help? Standard disclosure forms required by journals? I’m happy to see that the economic meltdown has prompted some soul-searching about where economists went wrong. Maybe a good starting point would professional transparency. "Most people who know Michael Taylor’s name recall that he worked as Monsanto’s lawyer at King & Spalding for years before being appointed to the FDA to oversee the swift introduction into the marketplace of GMOs. He did so by ramming through a faux scientific regulatory conceit called “substantial equivalence.”....Since shedding the title of Vice President of Monsanto, Taylor has been busy promoting the concept of “risk assessment” as a means to deal with food-borne illness as an alternative to urging regulatory agencies to actually enforce laws already on the books and to adequately fund them so they could do so. Like “substantial equivalence,” the risk assessment conceit offers a great opportunity to change the system to benefit corporate interests....."
"....President Obama’s nominee for Commissioner of the Food and Drug Administration Margaret Hamburg, MD, sits on the board of directors at the Trust for America’s Health. Hamburg, a well-connected player in the public health field, also serves on the board of directors of the Rockefeller Foundation...."
The e-mail, written by the Chamber's senior health policy manager and obtained by The Washington Post, proposes spending $50,000 to hire a "respected economist" to study the impact of health-care legislation, which is expected to come to the Senate floor this week, would have on jobs and the economy. Step two, according to the e-mail, appears to assume the outcome of the economic review: "The economist will then circulate a sign-on letter to hundreds of other economists saying that the bill will kill jobs and hurt the economy. We will then be able to use this open letter to produce advertisements, and as a powerful lobbying and grass-roots document". Shear, Michael D. 2009. "Health Bill Foes Solicit Funds for Economic Study." Washington Post (16 November). On the evening of September 23, 1952, General Dwight D. Eisenhower, the Republican nominee for President of the United States, was scheduled to deliver a campaign speech in Cleveland, Ohio. That night however, his vice-presidential running mate, Richard M. Nixon, gave his famous "Checkers" speech defending himself from charges that he had received inappropriate financial gifts. Instead of his originally scheduled address, whose topic was inflation and "false prosperity", Eisenhower substituted his reaction to Nixon's televised appearance. The text of Ike's unspoken speech was published the next day in the Washington Post and Eisenhower essentially "the same" speech a month later in Troy, New York. But that later version of the speech, coming just a week and a half before election day, would have had little impact on framing the election campaign. The Eisenhower speech's theme of "false prosperity" echoes elements of essayist and literary critic Kenneth Burke's satirical essay of twenty-two years earlier, "Waste – the future of prosperity," which Burke subsequently reprised in a 1958 essay, "Borrow. Spend. Buy. Waste. Want." The particular variety of waste that Eisenhower condemned in his speech was the Truman administration's policy of using massive rearmament spending to stimulate the economy -- a policy whose single-mindedly cynical deliberateness would be revealed in 1975 when National Security Council memorandum 68 (NSC-68) was declassified (see especially Fred Block's 1980 Politics and Society article, Economic Instability and Military Strength: The Paradoxes of the 1950 Rearmament Decision). I want to quote resonating paragraphs from Burke's 1930, Ike's 1952 speech and NSC-68 and also to suggest that a profound amnesia and denial about the manifestly wasteful sources of "economic growth" massively constrain and distort American political discourse and thought -- both popular and academic. "But by expanding this principle, we find even greater encouragement. For long we have worried about war, driven by a pre-industrial feeling that war is the enemy of mankind. But by the theory of the economic value of waste we find that war is the basis of culture. War is our great economic safety-valve. For if waste lets up, if people simply won't throw out things fast enough to create new needs in keeping with the increased output under improved methods of manufacture, we always have recourse to the still more thoroughgoing wastage of war. An intelligently managed war can leave whole nations to be rebuilt, thus providing work at peak productivity for millions of the surviving population." Ike: "The inflation we suffer is not an accident; it is a policy. It is not, as the Administration would have us believe some queer and deadly kind of economic bacteria breathed into the atmosphere by Soviet communism. "There is in certain quarters the view that national prosperity depends on the production of armaments and that any reduc­tion in arms output might bring on another recession. Does this mean, then that the continued failure of our foreign policy is the only way to pay for the failure of our fiscal policy? According to this way of thinking, the success of our foreign policy would mean a depression." NSC-68: " Furthermore, the United States could achieve a substantial absolute increase in output and could thereby increase the allocation of resources to a build-up of the economic and military strength of itself and its allies without suffering a decline in its real standard of living. Industrial production declined by 10 percent between the first quarter of 1948 and the last quarter of 1949, and by approximately one-fourth between 1944 and 1949. In March 1950 there were approximately 4,750,000 unemployed, as compared to 1,070,000 in 1943 and 670,000 in 1944. The gross national product declined slowly in 1949 from the peak reached in 1948 ($262 billion in 1948 to an annual rate of $256 billion in the last six months of 1949), and in terms of constant prices declined by about 20 percent between 1944 and 1948. "With a high level of economic activity, the United States could soon attain a gross national product of $300 billion per year, as was pointed out in the President's Economic Report (January 1950). Progress in this direction would permit, and might itself be aided by, a buildup of the economic and military strength of the United States and the free world; furthermore, if a dynamic expansion of the economy were achieved, the necessary build-up could be accomplished without a decrease in the national standard of living because the required resources could be obtained by siphoning off a part of the annual increment in the gross national product. These are facts of fundamental importance in considering the courses of action open to the United States." It's the WASTE, stupid. The stock market knows that the more unemployment there is, the more waste the federal government will be encouraged to buy. There is no alternative. As Kenneth Burke observed in his 1930 satire, "We have simply to make sure that the increase in the number of labor-saving devices does not shorten the hours of labor." Even Paul Krugman has dipped his toe in that water, as had Alec MacGillis of the Washington Post the week before. Larry Summers has tipped off Wall Street that the White House won't make any such "mistake": "It may be desirable [to the unemployed] to have a given amount of work shared among more people. But that's not as desirable [to Wall Street] as expanding the total amount of work." Robert Reich, along with the AFL-CIO, appears to still be sitting on the fence on this one. Shame! "Is Work Sharing A Viable Solution To The Unemployment Problem?" Both Baker and Paul Krugman point to the example of Germany, which has a work sharing program, along with strong labor protections. As Krugman wrote, the measures "didn’t prevent a nasty recession, but Germany got through the recession with remarkably few job losses." Plus, as Peter Dorman at EconoSpeak noted, work sharing helps preserve human capital, as firms don’t have to re-hire and re-train workers down the line — they just increase their hours back to where they were previously. All that said, this is still only a B- idea. (Krugman acknowledges this, calling it the "third-best" economic policy available, after committing to moderate inflation to lower interest rates or further fiscal stimulus.) In the absence of stronger stimulus measures, such as aid to states or a direct job program, it will do some good — and it may be the only thing that a deficit-crazed Congress is willing to consider. But it is inefficient, has the potential to be wasteful, and obviously does nothing for those already out of work. Work sharing isn’t terrible, but I’d like to think that we can do better. Compared to utter failure, B minus looks like genius. In terms of "doing better" one first has to take stock of what "progress" might conceivably mean. I like to start with Adam Smith's summary of "what constitutes the real happiness of human life": ease of body and peace of mind. Then there is Thomas Jefferson's prescription, "If we can prevent government from wasting the labors of the people under the pretense of taking care of them, they must become happy." Down through the ages, philosophers, theologians and even economists (Mill, Marx, Marshall, Veblen, Keynes…) have extolled the virtues of leisure and downplayed the accumulation of material possessions. The trauma of the 1930s Depression and the subsequent World War II seem to have locked the American psyche into the fixed idea that economic growth — by whatever means necessary — is the holy grail. This has produced six decades of what Dwight Eisenhower called "false prosperity", that is to say increase of gross output, fueled by military spending and other wasteful indulgences, and heedless of its impact on the environment, the social fabric and the character of individuals. "It has been computed by some political arithmetician, that if every man and woman would work for four hours each day on something useful, that labor would produce sufficient to procure all the necessaries and comforts of life ; want and misery would be banished out of the world, and the rest of the twenty-four hours might be leisure and pleasure." Nearly a century ago, in the wake of World War I, Stephen Leacock observed, "The nerves of our industrial civilization are worn thin with the rattle of its own machinery," Leacock wrote, "The industrial world is restless, over-strained and quarrelsome. It seethes with furious discontent, and looks about it eagerly for a fight. It needs a rest." Leacock argued that reducing the hours of work "should be among the primary aims of social reform," and recommended "such a shortening as will strain the machine to a breaking point, but never break it." Keynes concurred with a vision of a 15-hour work week as a realistic prospect for the future. Two months before his assassination, President John F. Kennedy mused, "we are going to find the workweek reduced, and we are going to find people wondering what they should do…" Two years later, his brother, Bobby, delivered a famous critique of the GNP inability to measure a country's health. The measure "counts special locks for our doors and the jails for those who break them" but not "the health of our children, the quality of their education or the joy of their play." That speech, by the way, was cited by President Obama during the election campaign to illustrate his conviction that a "paradigm shift" was needed in economics before it became too late. Just last March, the UK's Sustainable Development Commission issued a report, "Prosperity without Growth? ", pointing out that the ongoing obsession with economic growth was making environmental catastrophe inevitable even as it was not delivering on its mythical promises of stability and reduction of poverty. The report called the continuing growth imperative a delusion. Even if work-sharing is "still only a B- idea" it is at least a step in the right direction and, perhaps, the thin edge of a wedge that will ultimately pull down the temple of idolatry dedicated to economic growth. The growth imperative's ideological foundations in the Cold War NSC-68 doctrine and economic competition with the "Soviet Menace" have been long forgotten, even as their analytically-incoherent economic justifications have been elevated to the status of incontestable dogma. An A+ idea would consist of consigning the entire putrefying economic paradigm to its appropriate dust bin. For now, we would do well to settle for B-. Last January, I presented a paper at the ASSA meetings offering my own take on the state of the world, entitled “The Financial Crisis Through the Lens of Global Imbalances”. My main point was that dollar recycling broke down as many of us expected it would, but not at the international level; rather, the breakdown occurred in the transmission mechanism that linked households to capital inflows. There were other surprises too, but nothing that would alter the conclusion that astronomic US current account deficits were ultimately culpable. I revised the paper over the summer with the intention of publishing it, but, having received a request to make additional changes, decided it was a creature of its moment, and I should just let it be. The next iteration is on my calendar for December; I will consider the arguments of Obstfeld and Rogoff, among others, and try once more to slay the conventional wisdom. Meanwhile, if you want to see what I was thinking back in the day, you can find it here. Is The Media Being Hysterical About The Dollar? Yes. Anyway, that is the way I and Dean Baker see it ("What would a rout of the dollar look like?"). For quite some time now, there have been lots of articles in leading newspapers and magazines, as well as gobs of commentators on TV talk shows, all hyperventilating about the decline of the dollar and how it is likely to get much worse, with a terrible crash likely in the near future, and so on. This story has gotten so widespread that it is now taken as simply a stylized fact. Buried partway down in a front page story today in WaPo was the phrase "rapid decline of the dollar," referring to recent events. Well, the dollar has been declining with some wiggles since a high around 1.26 per euro in mid-February to 1.48 something a few minutes ago. However, since it hit 1.5 in late October, it has basically been oscillating in a narrow range, no trend, with the Chinese holding the yuan/rmb fixed against it. That high in February recreated a high in November, which followed the upward rush of the dollar (as a "safe haven") in the midst of the general global financial crash following the Minsky moment on Sept. 18. Earlier that summer the dollar was noticeably lower than it is now, hitting 1.6 against the euro at one point. This is just hysteria. Dean points out that if somehow the dollar were to fall sharply, one would almost certainly see Europeans and Chinese and Japanese intervening in the market to stop it. Why? No way they want to face trade competition from a super low dollar, and indeed, the dollar currently seems to go up when domestic economic news is bad and down when it is good. All of this frothing at the mouth is just congealed propaganda by those who want to see a tightening of monetary policy and an ending of the fiscal stimulus. That the media so widely has bought into it is nauseating. Jeremy Lovell asks Can You Have Prosperity Without Growth? at the New York Times. "…Adults and children received a bullet to the brain, while babies – whether injured or not – were held by the ankles “just like goanna”, their skulls smashed against trees or rocks.30 A crying baby left behind when Garrwa people fled a camp on the Robinson River was thrown onto the hot coals of a cooking fire, still crying." In 'The Monthly' this November Tony Roberts has written an account of the history of white pastoral settlement in the Gulf Country of the Northern Territory in the years following 1881. At that time the colonial government (administered from the Southern city of Adelaide) handed over an area equivalent in size to the Australian state of Victoria to just 14 landholders. All but two had a policy of shooting dead the local aboriginal population to facilitate the easy commercialisation of land-use. It's interesting to note that Tony Roberts has pointed his finger for these unhindered massacres at particular individuals in power at the time. All with a 'Sir' in front of their names; a reward from the British global empire. "For globalism to work, America can't be afraid to act like the almighty superpower that it is....The hidden hand of the market will never work without a hidden fist-McDonald's cannot flourish without McDonnell Douglas, the designer of the F-15. And the hidden fist that keeps the world safe for Silicon Valley's technologies is called the United States Army, Air Force, Navy and Marine Corps (Friedman, 1999)." Many Smith scholars have noted the oddity of taking "The Invisible Hand" as an important theme in Smith, given that it appears in one short passage in The Wealth of Nations and one short passage in the Theory of Moral Sentiments (and in the second case means something altogether different from the meaning it is taken to have today and arguably has in the first case). Gavin Kennedy has made this point on his blog. Emma Rothschild's book, Economic Sentiments, makes it as well. But a new paper by Daniel Klein argues, contrarily, for the centrality of the concept to Smith's thought, and here, I kid you not, is why: these two tiny passages each occur at the exact midpoint of the books in which they appear!!! Dean Baker at New Deal 2.0. There is in certain quarters the view that national prosperity depends on the production of armaments and that any reduction in arms output might bring on another recession. Does this mean, then that the continued failure of our foreign policy is the only way to pay for the failure of our fiscal policy? According to this way of thinking, the success of our foreign policy would mean a depression. On September 23, 1952, General Dwight D. Eisenhower, the Republican Party nominee for the office of President of the United States, was scheduled to give a speech in Cleveland, Ohio. That speech was preempted, however by Richard M. Nixon's Checker's Speech. Instead of delivering his prepared speech, Eisenhower presented a his reaction to Nixon's defense of his finances. Nevertheless, the text of Ike's unspoken speech was published in the Washington Post and New York Times. It's theme was to have been "Prosperity without War." Fifty-seven years later, that theme resonates in the title of the Sustainable Development Commission report, Prosperity without Growth?, first published last March, with a revised, second edition (sans question mark) published last week. Eisenhower's speech was a sustained polemic expressly directed at the Truman administration policies conceived by Leon Keyserling. Although Ike didn't name Keyserling in the speech, he did the next best thing. He cited the protest resignation of the Edwin G. Nourse, whom Keyserling succeeded as Chairman of the Council of Economic Advisors. To anyone familiar with Keyserling's conceptual role with regard to the economics of NSC-68, several passages in Ike's speech stand out as direct indictments. Now, Ike's feeble prescriptions were woefully inadequate to the magnitude of the problems he so acutely critiqued in his speech. That's why I only sort of like Ike. It's not as if Truman and his advisors didn't have some pretty wicked problems to try to manage. And the military-industrial complex that President Eisenhower warned about in his farewell address didn't exactly evaporate during his term in office. First: how many days in the year, or hours in the day, can a man work, without either incommoding himself, or becoming unhappy? One may perceive, at the first glance, that this question refers to the nature of the climate; to the constitution, and to the strength of men; to their education, to their aliments; &c. &c. all cases, which may be easily resolved. Secondly, how many days must a man work in the year, or, how many hours must he work in the day, to procure for himself that which is necessary to his preservation, and his ease? Having resolved these questions, it will be no difficult matter to determine how many days in the year, or how many hours in the day, may remain for this man to dispose of: that is to say, how many may be demanded of him, without robbing him either of the means of subsistence, or of welfare; so that now, the whole matter rests upon an examination, whether the performance of that duty, which the sovereign exacts from him, be within, or beyond the time, which each man can spare from his absolutely necessary avocations. For an opposing view to that of Chastellux and Jefferson (and the US Declaration of Independence), see Larry Summers: "It may be desirable to have a given amount of work shared among more people. But that's not as desirable as expanding the total amount of work." Time for Summers vacation (thanks to Peggy Dobbins for the slogan). School's out. Who Killed More: Communism Or Naziism?